LOS ANGELES, CA - On August 26, Video Services Corp. (VSC) will release on DVD the complete fourth season of Broadway Video and IFC's hit original comedy series Portlandia: Season 4 . Created, written by and starring Fred Armisen ("Saturday Night Live" "Late Night with Seth Meyers") and Carrie Brownstein (WILD FLAG, Sleater-Kinney vocalist/guitarist), the Emmy(R)-nominated and Peabody(c) award-winning series returns with a new season of character-driven sketches taking place in the affable and absurd land of "Portlandia". This 2-disc DVD set contains all 10 episodes and will be available for an SRP of $19.98. Among the Armisen and Brownstein characters returning for the latest installment of this surreal yet affectionate portrait of Portland, Oregon are Dave and Kath, two of the town's most uptight residents who decide to give relaxing a try; Spyke and his girlfriend, Iris, who struggle through a hard time at a bad Thai restaurant; and Nina and Lance, who recover from the trauma of a deceased pet. An eclectic collection of talented guests visit Portlandia: Season 4 on this season: Tunde Adebimpe (TV On The Radio), Jello Biafra (Dead Kennedys), Vanessa Bayer ("Saturday Night Live"), Kirsten Dunst (Melancholia, Spider-Man), Joshua Homme (Queens of the Stone Age), singer-songwriter k.d. lang, Duff McKagan (Gun N' Roses, Velvet Revolver), Silas Weir Mitchell ("Grimm"), Michael Nesmith (The Monkees), Mark Proksch ("The Office"), Maya Rudolph (The Way, Way Back, Bridesmaids), columnist Dan Savage, Nick Swardson ("Reno 911! "), jazz duo Tuck and Patti, Jeff Tweedy (Wilco) and Olivia Wilde (HER, "House")! Fan favorites back from previous seasons include Ed Begley Jr. ("Arrested Development", Pineapple Express), Annie Clark (St. Vincent), Jeff Goldblum ("The League"), Kumail Nanjiani ("Silicon Valley", "Franklin & Bash"), Jason Sudeikis ("Eastbound & Down") and director Gus Van Sant (Promised Land, Milk). Kyle MacLachlan ("How I Met Your Mother", "Desperate Housewives") also returns as Portlandia's clueless but lovable Mayor. Shot entirely on location in Portland, Oregon, the series is co-created and co-written by Fred Armisen, Carrie Brownstein and Jonathan Krisel, who is also the series director. 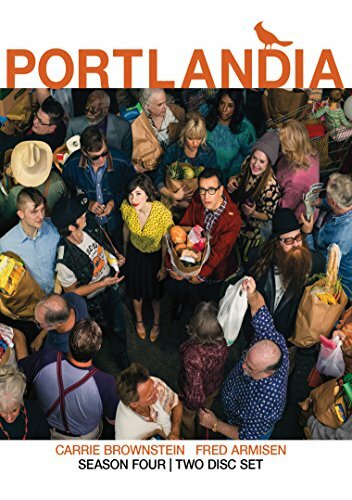 Portlandia: Season 4 is executive produced by Lorne Michaels and produced by Broadway Video. Copyright: (c) 2014 Broadway Video Entertainment, Inc. Founded in 1993 by former rock critic Jonathan Gross, Video Services Corp. (VSC) is a leading independent all platform film distributor with offices in Toronto and Los Angeles. VSC's DVD catalogue includes "Corner Gas," Sharknado, "Comedy Now! Starring Russell Peters" and "Spectacle: Elvis Costello With...." Recent theatrical releases include Union Square, with Oscar(R) winner Mira Sorvino, Alan Partridge, starring Steve Coogan, and the Israeli horror sensation Big Bad Wolves. VSC has an eclectic 2014 slate that features Cannes Selection Life Itself, Frank, starring Michael Fassbender and Honeymoon, starring Rose Leslie. Broadway Video Entertainment (BVE) is a global media and entertainment company led by Lorne Michaels, the creator and executive producer of "Saturday Night Live" and executive producer of "30 Rock," and "Late Night with Jimmy Fallon." More recently BVE produced "Portlandia" and "The Awesomes" and recently added "The Tonight Show Starring Jimmy Fallon" and "Late Night with Seth Meyers" to its production slate. BVE has several divisions focused on the creation, acquisition and distribution of content on a worldwide basis. The main parts of the company include: BVE's television and movie divisions, which produce some of the country's most popular TV programming and feature films; Broadway Video Enterprises, BVE's distribution arm, which creates brand extensions and distributes BV's library in over 170 countries; Broadway Video Ventures, BVE's investment and acquisition arm focused on emerging technology and media companies; Above Average Productions, a leading online comedy network and digital studio, Broadway Video Post Production, a state-of-the-art design and post production facility staffed by the industry's most creative visual and sound designers.